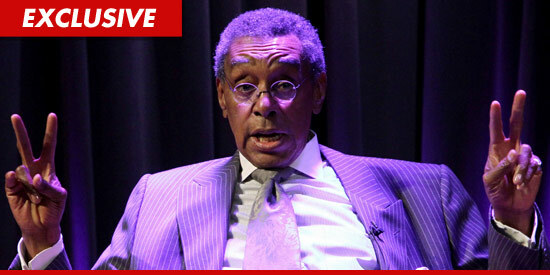 Don Cornelius -- who famously created "Soul Train" was found dead in his Sherman Oaks, CA home this morning ... and law enforcement sources tell us it appears he committed suicide. We're told cops discovered the body at around 4 AM PT. Law enforcement sources tell us ... Cornelius died from a gunshot wound to the head and officials believe the wound was self-inflicted. We're told Cornelius was taken to the hospital where he was pronounced dead. "Soul Train" changed the landscape of television when it debuted in 1971 and ran until 2006. Officials have notified Don's family. SAD that a soul, pardon the pun, would be so tortured. Well...i bet its from a lonley old 75 year old man who is now paying his ex-wife. I think I read on another page he was living alone so he went from having arm candy to nothing.....sad if it is related to that. Old men dont normaly commit suicide, and espcialy old black men. She looks like a whack job to me. Crazy women make people do crazy sh*t. Ask Mel Gibson. women will get married, maybe prego...wait a few years, then bounce and clean your wallet out. She looks to be at least 30+ years younger....that right there is a sign. 10 maybe 15 years younger MAX!!!! anything else is too far of a gap. I wonder if it was for financial reasons. Will never be another show like it. I think Don was pretty set. He sold Soul Train and the back catalog of shows to BET awhile back for millions. Soul Train records was sold to a major label back in the 90's. The Sound of Philadelphia (Soul Train Theme Song) still brings in nice royalty checks. I'm guessing it was something disease related and he probably didn't want to go out slow and painfully. Sad too because VH1 recently did a mini-documentary on Soul Train. I'll link to the video if I can find it. It was a good watch. Don was WAY ahead of his time. For a black show producer to OWN EVERYTHING including the rights to the show and to have a nationwide TV show distributed on major networks without white, mafia, or Jewish backing or money was absolutely unheard of in those times. Even James Brown couldn't believe he didn't have someone "with him" on the venture. Last edited by Heist; February 1, 2012 at 10:36 AM.. Here's the documentary. A good watch if you have the time. Sad too because VH1 recently did a mini-documentary on Soul Train. I'll link to the video if I can find it. It was a good watch. Don was WAY ahead of his time. For a black show producer to OWN EVERYTHING including the rights to the show and to have a nation TV show on major networks without white, mafia, or Jewish backing or money was absolutely unheard of in those times. Wow I truly self made man. He still could not dance the line. Only time he did he fell. Apparent suicides in Hollywood and the entertainment biz in general aren't always so easy to explain. I wonder if the scientologists had a beef with him.